* Starts off with the money shot – boozy fruit. Specifically tequila that is strong- slightly tempered with citrus and a little bit of cinnamon. * I would not recommend wearing this when driving. If you happened to be pulled over by a police officer, they won’t even bother with a breathalyzer. * When the fruit starts to burn off – it’s full-on tequila with a hint of resins burning. * You would get the same effects by splashing the real stuff on you and walking by a campfire. * The base is fruity wood and stays really close to the skin. 12 hours. I’ve only smelled Ponche Shower gel once and I remember it being tequila and citrus – so, based on that scent memory, this is a faithful interpretation. Reeking of Tequila is not the best approach for work, so this is clearly not office-friendly. Although this is full-bodied, I see this being a great spring, summer, and vacation scent. 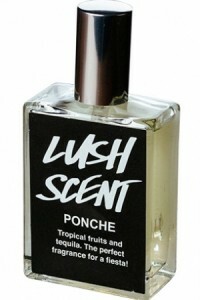 Lush Scent Ponche is a limited edition that was available only from their website. Check there first to see if it is still available. If not, ebay is pretty much your only option.